SHANGHAI - China's first-ever stock-index futures rose on their debut on Friday against the fall of the main stock index, indicating investors' warm welcome for the new trading tool. All the four contracts based on the CSI 300 Index, which tracks 300 large caps traded on the Shanghai and Shenzhen bourses, advanced in Friday's trading to reach over 60.5 billion yuan ($8.86 billion) in combined turnover. The most actively traded May futures contract closed at 3415.6, up 0.5 percent from 3399, the base price the China Financial Futures Exchange (CFFEX) set for all four contracts, after climbing to an all-day high of 3488 in early trading. The June contract was up 42.6 points to 3441.6, the September contract jumped 3.32 percent to 3512 and the December contract rose 4.65 percent to 3557. "The upward movement of all four futures contracts, which bucked the downtrend of the CSI Index, indicated a strong speculative mood in the market," said Xiao Cheng, an investment manager from GF Securities. The spot CSI 300 Index sank 1.13 percent to end at 3356.3 on Friday, while the benchmark Shanghai Composite Index was down 1.1 percent after the government unveiled tightening measures to curb the overheating property market by raising the down payment level for second homes to at least 50 percent from 40 percent. "China's stock-index futures markets, which are mainly dominated by capital from private equity funds so far, are still too small in market size to be stable. That's why we see major contracts closing down from their opening prices when the spot share markets slipped," said Zhang Zhaowei, a senior analyst at Hua An Securities. The introduction of stock index futures was a milestone in China's equities market to diversify trading instruments for investors and also to help cushion risks in the stock market through hedging. Investors are required to have a minimum of 500,000 yuan to open an account to trade the new products, according to rules issued by CFFEX, while initial margins are set at 15 to 18 percent, one of the highest among its global and Asian peers. In addition, eligible investors are required to have conducted mock trading in index futures for at least 10 trading days along with at least 20 transactions. Meanwhile, some institutional investors are not allowed to trade at present. "The securities regulator is taking very cautious steps to develop the new financial derivative, hoping to avoid over-speculation that can lead to market volatility," said Cao Fengqi, deputy director of Guanghua School of Management at Peking University, adding that most individual investors will be kept out of the market due to the stringent entry requirements for futures trading. 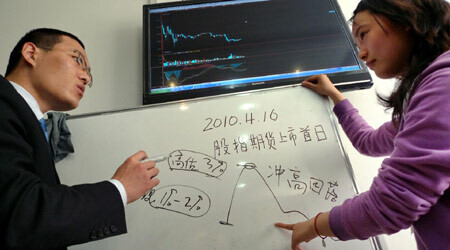 "Most investors still have a wait and see attitude," Zhang said. Analysts estimated that the market will gradually mature when more major institutional investors, including mutual funds, qualified foreign institutional investors, and the social security funds, are allowed to participate. Looking ahead, Zhang said the contracts' movement will largely depend on the country's economic fundamentals and the upcoming macro policies, but it will not have major impact on the stock market movement going forward.